Bread puddings are the epitome of warm, homey comfort food. We always remember all the delicious dessert bread puddings and often overlook that savory bread puddings are celebrated soul friendly brunch entrées or a dinner side dishes. 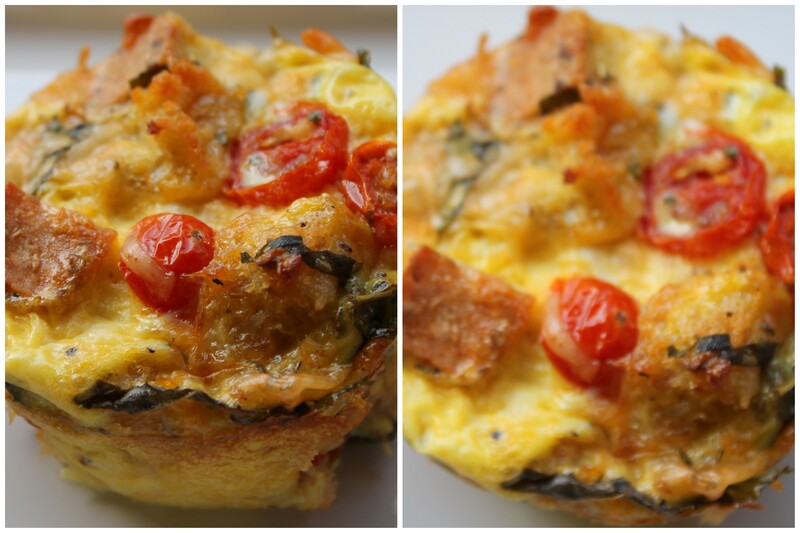 A few years ago I came across a remarkable Tomato-Basil Bread Pudding recipe created by Giada de Laurentiis. Over the years I have created several brunch versions of this and have enjoyed all of them. 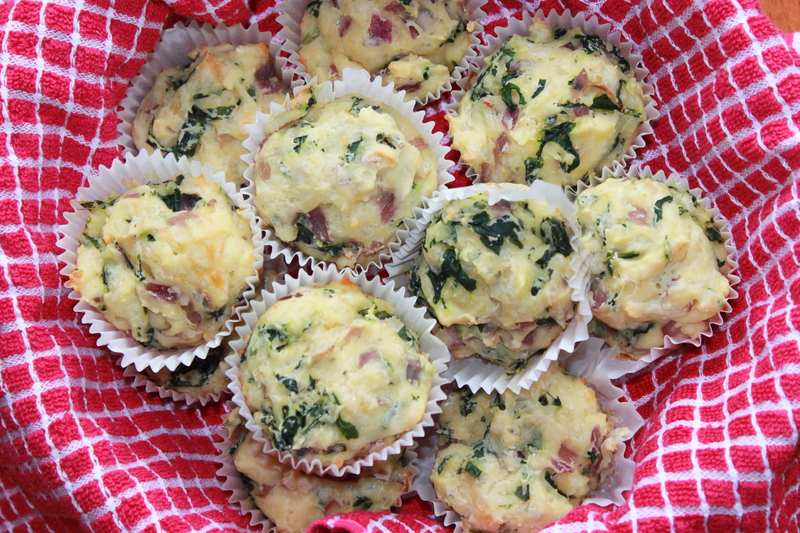 It’s a versatile recipe that can take on the addition of any favorite omelet ingredient – ham, mushrooms, green peppers etc. This version doesn’t deviate too far from the original recipe. I add in some Fontina cheese for extra creaminess and some hot sauce for an underlying kick. Creating individual portions in cupcake tins gives a little vigor to comfort classic. We live in a world filled with uncertainty and reoccurring horrific events that are so complicated to fathom. The news coverage of these recent tragic recent events – Boston and Baghdad bombings, fatal earthquake in Iran and the continuing Syrian Civil War send shivers down my spine. The images depicting carnage of innocent citizens and widespread annihilation of their towns and cities reiterate the fragility of human lives and the world we live in. They are reminders that everyday is a gift and one must constantly cherish and love our family and friends. Yes the magic of the holidays is right around the corner. Unfortunately, this most wonderful time comes coupled with the stress of entertaining hordes of guests that show up with the holidays. The key to survive is to keep things simple, yet delicious. This is a great time to take some help from your favorite food stores and create semi-homemade menus. The easiest way to entertain is to host a cocktail party with exciting drinks and mouthwatering appetizers. It keeps things uncomplicated, especially since several appetizers can be made and assembled ahead of time. No cocktail party is ever complete without at least one or two cheese-centric Hors d’oeuvres. While anything with warm, melted cheese tastes delicious presentation is also crucial at these cocktail parties. So instead of a classic cracker or crostini topped with a melted cheese mixture, why not delight your guests by serving up some cheesy-goodness in an edible mini-cup? These chili-cheese wonton cups with a bubbly mixture of cheese brightened up with fresh chives and a hint of earthy cumin is a scrumptious and exquisite looking appetizer. Time: Active: 10 minutes; Baking 18-20 minutes. 5-6 green or black pitted olives, thinly sliced. I used regular pepper jack cheese, but you can use a lower fat version or substitute with cheddar cheese. Once you master how to make the wonton cups, you can get creative and play around with the edges of the wonton to create slightly different shapes. The third cup in the picture has a more leafy effect as I played around with the edges to create it. The cups (without the filling) can be made a day in advance and should be stored in an air-tight container. 1) Pre-heat the oven to 350 degree F. Coat a miniature muffin tin (24 mini muffins) with cooking spray and set aside. 3) While the wonton cups are baking, in a small bowl combine the cheeses, jalapeno, chives, salt, cumin and pepper. Once everything is well combined set it aside. 4) Remove the cups from the oven and spoon the cheese mixture into each of the cups. Top with 1-2 olive slices and bake for 10 minutes or longer until golden brown and bubbly. Serve warm. While the turkey is the superstar of a Thanksgiving dinner, guests also gather around the holiday table eager to load up on its supporting cast members – the side dishes. So if you are hosting a Thanksgiving dinner, remember while these side dishes may seem slightly less import than the Turkey they are still an integral part of a Thanksgiving meal. These are also the dishes that can showcase your creativity and ingenuity as a cook. Take comfort classics and classic Thanksgiving side dishes and brighten them up with some exotic flavors or unexpected textures to add a little extra panache to your holiday table. Macaroni and Cheese is a comfort classic side dish of cheesy goodness that satiates the appetites of all age groups. While the base is always macaroni (or another pasta), cheese, milk and flour, people all over the world add different ingredients to their Mac and Cheese to personalize it. A few weeks ago, I stumbled upon Reem Rizvi’s (of Simply Reem) “Mac & Cheese – An Indian Touch” guest blog post on Life of Spice. Just reading the recipe I could imagine the flavors and aroma’s that the Indian spices added to this Mac and Cheese. My recipe is an adaptation of Reem’s with a few minor changes (specifically reducing the fat content a bit without reducing the flavor at all). 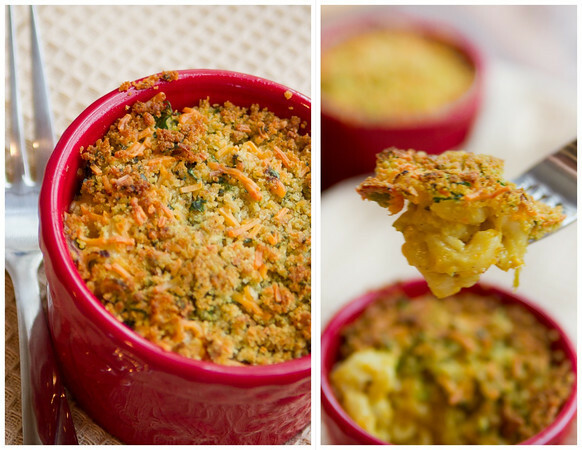 The warm and aromatic spices and the cilantro-scallion cheese crust in this Mac and Cheese add a layer of flamboyance to a familiar classic. So why not surprise your friends and family this Thanksgiving by treating their taste buds to a quick trip to the Indian sub-continent? 2 tablespoons cilantro, finely chopped. 1 jalapeno seeded and diced (optional). 1 teaspoon red chili powder or cayenne powder (or to taste). This is a great do-ahead recipe. Prepare and set aside everything till step 7 (including step 7) a day before. 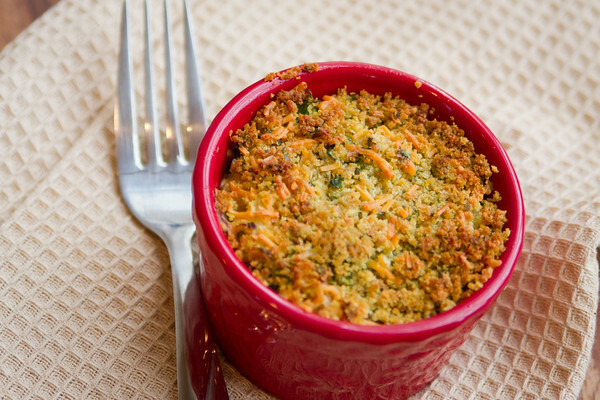 Just before you are ready to serve, top the macaroni and cheese mixture with the bread crumb mixture and bake everything together. 1) Pre-heat the oven to 350F and grease a 9” by 13” baking dish or 8, 5oz ramekins with little butter or cooking spray. 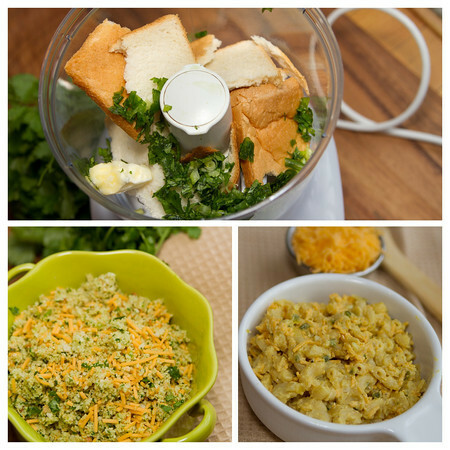 2) In a food processor, add the bread, cilantro and scallions with 3/4 tablespoon of the butter. Give it a quick pulse, till it starts to look like crumbs. Do not over pulse it as a little texture taste great. Add 1 cup of cheese and mix everything well. Set it aside. 3) Cook the macaroni according to the direction on the packet and set it aside. 4) In a large non-stick saucepan, heat the olive oil with the remaining 3/4 tablespoon of butter on medium heat. Once the oil is heated add the chopped onions, stir and cook until the onions soften and are just beginning to change color. Now add the ginger and garlic paste along with the jalapeno and cook for another minute. Keep stirring. 5) Add the garam masala, cumin, turmeric and chili powder, stir for about a minute. 6) Add the flour, salt and pepper and stir for about 2-3 minutes. Slowly add the warm milk and continue to stir as the milk mixture starts to thicken about 10-12 minutes. Remove from the heat and add 2 cups of the cheddar cheese. Stir well till the cheese melts into the sauce. Set the cheese sauce aside. 7) Stir the drained macaroni into the cheese sauce and give it a nice mix. Taste the salt and pepper at this stage and adjust it accordingly. 8) Pour everything in the greased baking dish or ramekins, top with the bread and cheese mixture that was prepared earlier. Bake in 350F oven for 25-30 minutes, until golden brown and bubbly on the top. Let it sit for 5 minutes before serving it. Diets are the worst form of persecution for a foodie. Every time I embark on one, the sights of baked treats taunt me and beseech me to cheat on my diet. I start dreaming of flaky puff pastry, moist chocolate cake, warm fruit pies and hearty loaves of bread! I had the misfortune of embarking on a diet a few weeks ago. I decided to amplify my exercise routines and cut back on treats and snacks to get into shape for an upcoming wedding. I usually manage to keep up the exercise but end up binging on baked treats after a few days of deprivation. It took me exactly a week, before I caved in and decided I needed to bake a bunch of treats and devour them. My friend Sneha, who is an amazing cook and an even better photographer agreed to join me for what we dubbed “Bake Fest 2012”! We baked puff pastry stuffed with a potato and cheese mixture, an orange Bundt cake, maple bacon chocolate-chip cookies and zucchini, herb and cheese bread. Each of these was divine, but the zucchini bread stole my heart. Freshly baked bread is unequivocally the best kind of bread. Unlike a lot of bread recipes that require yeast and time to rise, this bread took less than an hour from start to finish. It’s also a great way to deceive people who do not usually eat vegetables into eating healthful zucchini, as the cheese and herbs are the prominent flavors in the bread. This bread is ideal for a brunch or as a side to a soup for lunch or dinner. This recipe was found on the Hobby Farms website and after a few attempts, here is a slightly modified version of the original recipe. Adapted and Modified from the Hobby Farms website. I used rosemary, garlic chives and thyme, but you can use whatever fresh herbs you have available. Pre-heat the oven to 350°F (180°C). Grease and flour an 8-by-4-inch loaf pan and set aside. Add the fresh herbs and green onions to the dry ingredients and mix well till everything is combined. In a separate mixing bowl, beat the eggs lightly. Add the oil and milk to the beaten eggs and mix well. Stir the zucchini into the egg mixture. 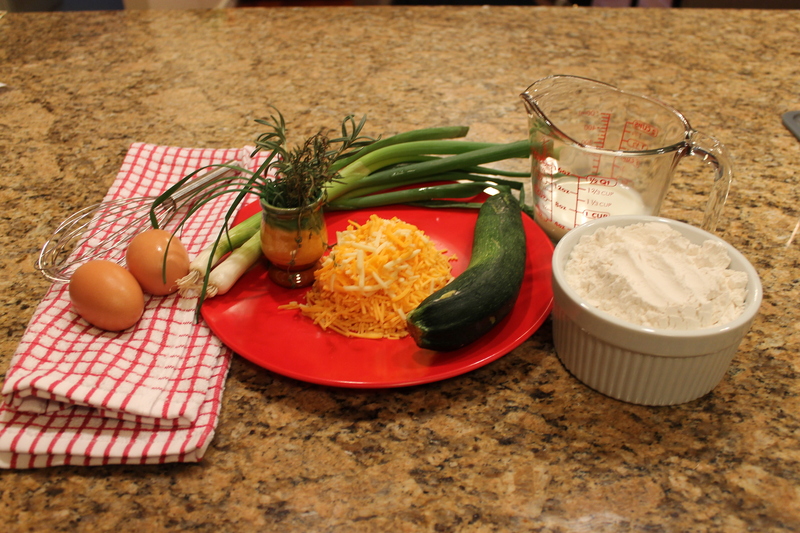 Fold the egg and zucchini mixture into the dry ingredients. Do this just until all the ingredients are moistened. Do not over mix. Pour this into the greased and floured loaf pan. Use a butter knife or spatula to smooth out the top of the batter. Bake at 350°F (180°C) for 40-45 minutes, or until a toothpick inserted into the center comes out clean. Place the loaf pan on the countertop and let the bread cool in the pan for 15 minutes. Then turn it out onto a wire rack and cool completely. 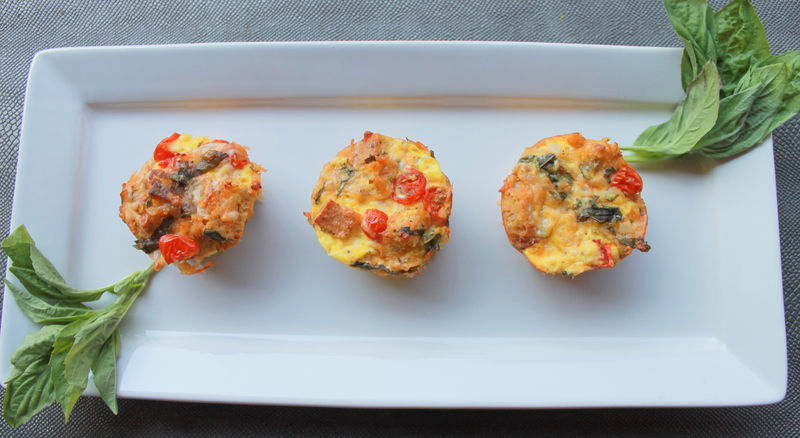 Serve at room temperature or slightly warm with butter, cream cheese or goat cheese.